A map shows state-to-state migration patterns in 2015, according to the 39th annual National Movers Study. 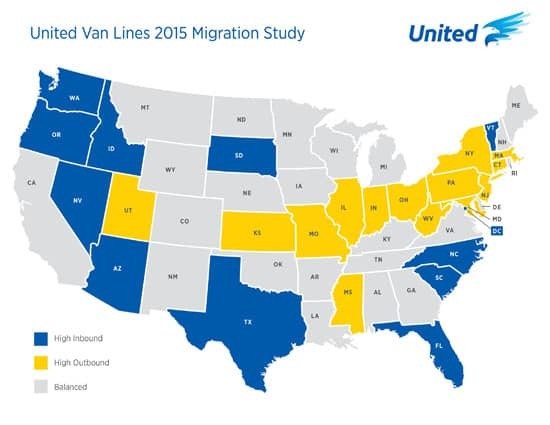 Vermont moved up to third in the nation and tops in the Northeast again in a national study on migration conducted by United Van Lines. The 39th annual National Movers Study, which tracks customers’ state-to-state migration patterns over the past year, showed that Oregon is the most popular moving destination of 2015 with 69 percent of moves to or from the state being inbound. The state has continued to climb the ranks, increasing inbound migration by 10 percent over the past six years, according to United Van Lines. New to the 2015 top inbound list is another Pacific West state, Washington, which came in at No. 10 with 56 percent inbound moves. Southern states also saw a high number of people moving in with 53 percent of total moves being inbound. In a separate survey of its customers, United Van Lines found the top reasons for moving South included company transfer/new job, retirement and proximity to family. United has tracked migration patterns annually on a state-by-state basis since 1977. For 2015, the study is based on household moves handled by United within the 48 contiguous states and Washington, D.C. United classifies states as “high inbound” if 55 percent or more of the moves are going into a state, “high outbound” if 55 percent or more moves were coming out of a state or “balanced” if the difference between inbound and outbound is negligible. The Western U.S. is represented on the high-inbound list by Oregon (69 percent), Nevada (57 percent) and Washington (56 percent). Of moves to Oregon, a new job or company transfer (53 percent) and wanting to be closer to family (20 percent) led the reasons for most inbound moves. Nevada remained on the high inbound list for the fifth consecutive year. In addition to the Northeast, Illinois (63 percent) held steady at the No. 3 spot, ranking in the top five for the last seven years. New additions to the top outbound list include Connecticut (63 percent), Massachusetts (57 percent) and Mississippi (56 percent). Several states gained approximately the same number of residents as those that left. This list of “balanced” states includes Alabama, North Dakota, Delaware and Louisiana. To view the entire study and an interactive map visit www.UnitedVanLines.com. District of ColumbiaFloridaIdahoMovingNevadaNorth CarolinaOregonSouth CarolinaTexasUnited Van LinesVermontWashingtonWhere’s America moving?